This is 19 incredible tips on working with wood glue. 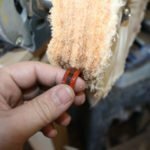 As a woodworker, you are going to be using a lot of glue, and the more you know about it the better. This will help you avoid mistakes, and make better projects. Number fourteen is my favorite. When you build things from wood, you need a way to attach them together. 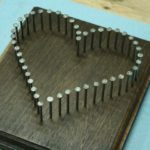 While there are many different ways to do this in woodworking, wood glue is the most common. Since you spend so much time working with and using wood glue, the more you know about it the better. Thankfully, it’s easy to learn about wood glue, and easy to apply what you learn in your shop. Don’t worry about getting them all into practice at once. Pick a few of them and start there. Once you have the habit, come back for more of them. 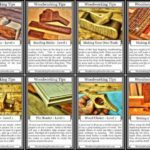 Enjoy the following 19 tips on working with wood glue. 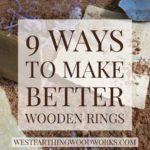 They will make you better at joining pieces together, and in turn make you a better woodworker. Wood glue in an interesting substance. When wet, it is a liquid that is easy to move around, and it spreads really thin. When in a solid form, it’s very hard, and difficult to remove. This is also one of the secrets to how wood glue works. When you apply a layer of glue between two surfaces of wood, the wet glue penetrates into the top most fibers of the wood on each piece. When the glue dries, it forms a solid piece of material that is stuck inside and between both pieces of wood at the same time. You can think of this like a person holding two other people by the hand. The middle person holds tightly to each of the other people, and they cannot get away. Glue does the same thing, and because it holds so well, it makes the wood feel like one solid piece. 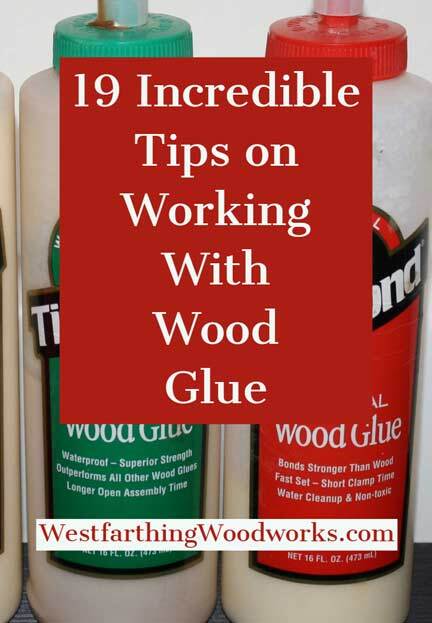 One of the best tips for working with woo glue is to keep it at room temperature. Extremes in cold or heat can ruin your glue. It’s more important to prevent freezing than high heat, but both of these temperature hazards make you glue weaker. One of the best places that you can keep your wood glue is in the house. Make a small area that is safe, and away from pets and children. Store your glue in this area, and as long as you keep your house at a reasonable temperature your glue will be fine. If your shop is climate controlled, then you won’t have to worry much about your glue getting too hot or too cold. Also, if you live in a mild climate you might not have to worry either. However, for those in warm and cold places, it’s worth bringing your glue into the house. Under no circumstances should you ever use wood glue that you think has been stored poorly, or not cared for. You should also throw away any glue that has passed the expiration date, or that does not look or feel the way you remember. Wood glue is cheap, even the good stuff. There is no reason to take a chance on the life of your projects because you want to save a few dollars on a bottle of glue. I know this sounds crazy, but people actually do it. Also, when you see that your wood glue looks different, that can be a sign. If your glue is really runny, really thick, lumpy, or has changed color significantly, these are all signs that you should just get some new glue. Again, for a few dollars it’s not worth it. There are a lot of fancy wood glues on the market. Some of them are good, and some of them are marketing. In the end, there are millions of carpenters past and present that use regular old wood glue and they all do just fine. Since you are gluing wood to wood, then a standard, name brand wood glue is all you need to be successful. In the event that you have a special situation where you need the glue to be waterproof or something like that, then you can buy a different glue. Woodworkers spend money on their supplies, so the manufacturers and marketers all want to sell you similar glue formulations in different bottles for similar tasks. Yes, these different glues are sometimes better for the purpose than wood glue, but for the overwhelming majority of what you are doing as a beginner, regular wood glue is still king. An interesting property of wood glue is that it creates a joint that is stronger than the wood itself. This is a huge statement about the strength of glue in general, as well as about how you can rely on the glue to keep your projects together. When you break a glue joint with force, something interesting happens. Since the glue is stronger than the surrounding wood, the joint will actually break to one side of the glue line or the other. The glue is stronger, so the wood gives up first. An exception to this rule is when you have a poor joint, bad glue, or some combination of both. Under normal circumstances, with a good setup, the joint will break on the wood, not on the glue between the piece. One of the best things that you can do with your wood glue is to throw it out when you think it’s gone bad. If you are even thinking that it might have gone bad, or will not work as well as it should, toss it and buy new. One of the best things about wood glue is that you can get it just about anywhere. If you are in the wood store, then you can just buy it when you are there. If this happens in the middle of a project, then just pop out and go to the store. Most stores that carry home goods and hardware will have wood glue. Make sure that the brand is the one you like, and pick up another bottle. If you think you have a bad bottle or that it has been affected in any way that makes it not work as well, always toss it. Most woodworkers are fine with getting glue all over their fingers. If this is you, it’s ok, but you can benefit from wearing gloves and keeping a wet rag nearby. These two things will make your gluing experience much more enjoyable. The gloves are important, because they will keep your fingers clean, and also help you avoid wiping glue on everything. One of the byproducts of getting glue on your fingers is wiping it all over the place, and that will make your shop look really messy. The wet rag is important for cleanup, and even more important for emergency cleanup. In the event that you get glue on something you should not, the wet rag saves you time, and you can clean up the mess before it causes any damage. The number one cause of a joint failing is the surfaces did not meet well. Wood glue is meant to be a thin layer between the two pieces, not a filler between them. Your mating surfaces need to fit together really well in order to get the best joint. The preparation work before you make a joint is important. Look at your two surfaces, and hold them together without any glue. Look at the joint, and see if you can find light. If you can, this means there are gaps between the pieces that can prevent the glue from doing the best job possible. All you need to do when you find light is to work the boards a little more. In most cases, a little more work with the hand plane, or another pass over the jointer is all you need to make the surfaces mate well. The less light leaks between the pieces means a better joint. Another thing that makes a joint not hold together well is when there is debris on the faces, or in the glue. Even the smallest pieces of debris cause the faces to remain farther part than they would without. This means a poor joint. Small, hard pieces of debris cause the boards to not come together fully. They can also cause the boards to rock, and the resulting joint will not be flat. This is easy to control though, you just have to pay attention. Before you add glue, wipe down or blow off the mating surfaces. Then, be extra careful when you re adding glue. If you get something in the glue, wipe it completely off with a clean rag and replace the glue in that are with fresh. Once you know that you don’t have anything floating in your glue, you are safe to bring the pieces together. If you still feel something in there, it’s always the best decision to take the pieces apart, clean off the glue, and start over. Wood glue works by having a thin layer that completely covers both mating surfaces. If you apply glue to just one side of the joint, you risk having spots that are not coated. Inside the joint, if there is a bare area, it’s not helping hold the pieces together. One of the easiest ways to get good glue coverage is to just spread a really thin layer on both sides of the joint. This way, no matter how you bring the pieces together, there will always be complete coverage on both faces. Applying glue to both faces is the best way to get complete coverage, and it’s a matter of coating them both. It will take a few more seconds than coating one side, but the time and the effort are well worth it. For smaller pieces, your finger is probably the best glue spreader that you have. However, once the surface gets bigger, the glue will start drying before you can get it spread out. This is not good, but you can fix it easily. There are a lot of ways to spread glue other than your fingers. Look in a woodworking store or a hardware store for one of these options, and it will help you spread the glue faster. The most common is a glue roller, and it comes attached to your bottle and as a single tool. There are a few different glue roller designs, most off them are silicone, and allow the dried glue to easily be torn off. Some of them are sold as tools that you use by hand, and others are attached to a glue bottle already. Either way you go, try the methods out so that you know what you like. It’s all about being comfortable enough to spread the glue well, and ensure that you have good coverage on the piece before you add your clamps. No matter how you apply your glue, the most important thing you can do with your joint is to make sure that there is complete coverage between the pieces. Use a roller, use your finger, apply to both faces, whatever it takes to get complete coverage. One little trick that you can do after you coat both sides is to rub your boards. Bring your pieces together, and then slide them back and forth about 1/2 an inch several times. This helps spread the glue, and ensures good coverage. Resist the urge to open the joint and see if you are thoroughly coated. If you cover both mating faces with glue, and you do a little rub for good measure, you can be assured that you are doing everything you can to get a good glue surface. One really good way of knowing that you have good glue coverage is to look for squeeze out. This happens when you add your clamps, and some glue comes out. Look for clues in your squeeze out, and you will know that you have a good joint. First, you should definitely see some glue come out. If you don’t have any glue come out, then you have not applied enough. Even with the best methods and the thinnest applications, wood glue will still run out when the pressure is applied. On the other hand, you should not see a torrent of glue either. This is an indication that there was way too much glue in the joint, and will require a lot of cleanup. It does take a little time, but there is a good happy medium that you will find where you get some squeeze out, but it’s not a total mess. This one is my favorite, and it happens to every woodworker. One of these days, you will make a mistake that will frustrate you and make you laugh. Perhaps not at the same time, but you will have a wide range of emotions when it does. If you do not protect the bench surface below your project when you are gluing, you can accidentally glue your project to your bench. It sounds funny, but it’s not that crazy considering that your project has to sit somewhere while the glue dries. The way to protect your bench, your project, and your pride is to use waxed paper. If you have to lay your project down on the bench, lay down some waxed paper first. The glue will not stick to the wax, and you can pull the paper right off your project after it dries. One of the classic blunders in woodworking is trying to glue too many boards together at the same time. Some people like the race against the clock pressure of gluing twenty pieces together in one shot, but for the beginners, this is a difficult task. Instead, glue your project together in sections, and then glue the sections together. If you work like this not only will you have a much easier time, but you can also take advantage of machines that may not have enough capacity to take the whole project. For example, you can glue up an eighteen inch wide cutting board in two sections that are both nine inches wide. Then, since they are not too wide at this point, you can pass them through a thickness planer or sander. Finally, you can carefully glue the two big pieces together. The beauty of this method is that you get to use the bigger machines that make woodworking easier, and you get to make bigger projects than the machines can’t handle at full size. Also, since you only have a couple pieces to join in the end, you only have one joint to worry about getting right. See Also: What Tools do I Need to Get Started Woodworking? It’s important to apply good clamping pressure when you are gluing things together. This is really easy to do, and there are a lot of great clamps on the market that allow you to dial up a ton of pressure. This is a good and a bad thing. You really only need enough clamping pressure to bring the pieces together and hold them still until the glue dries. It’s not like you can force them any closer than physics will allow anyway, so all you’re really doing with tons and tons of force is pressing out more glue. It’s important that the pieces be tight, but not overly tight. This is more about getting very even pressure along the joint, and making sure that the pieces meet well. Don’t go too loose, and don’t crank the clamps until you think your fingers are going to fall off either. After you add your clamps, the glue is going to come out. When this happens, be ready to clean it with a rag. There are a couple thought process on cleaning glue, and you will be successful either way you go. The first thought process is to clean it right away. If this is you, keep a wet rag and a small bucket of water for rinsing near the bench. After you apply the clamps, wipe away as much glue squeeze out as you can immediately. If you are a little more patient, wait until the glue has gelled, and then peel it off. This does require you to hit a sweet spot, but the glue will tell you. At some point in the drying, the glue will get a little rubbery. When that happens, pull the glue off with your hands and it will peel like a line of caulk. I recommend that you wipe the glue with a rag right away, because it’s cleaner. When glue is allowed to enter the wood surface, it interferes with the finish. The gelled glue still leaves some glue on the surface, and it needs to be sanded off before a finish is applied. Glue takes time to dry. Most wood glue needs an hour to grab, and then several more hours before you can flex or stress the joint. Read your bottle, and make sure to follow the directions for the best results. However, one thing that the bottle might not tell you is that leaving the glue joint to dry overnight is one of the best things you can do. A well cured glue joint is very strong, and it’s a waste of time to rush too soon and break a joint because it was still wet. The easiest way to allow several hours for the joint to cure is to just leave it overnight. In the morning, remove the clamps, and check the joint. Odds are that the glue is fully cured, and that you have a strong joint to work with. A problem with wood glue and glue in general is that it shows under a finish. The reason is that the glue alters the adsorption rate of the wood surface, and the stain or finish does not enter the wood at the same rate. This shows as a lighter looking spot, and you can see it from space. 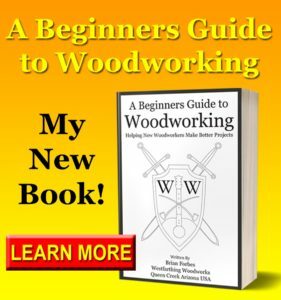 Are You Ready to Write Your Own Woodworking Book? 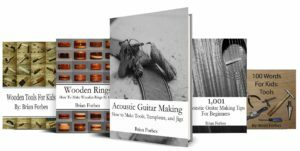 Your Personal Journey in Woodworking. Do you need a place to organize your ideas? Have you forgotten some of them? Need a safe spot to record your projects? 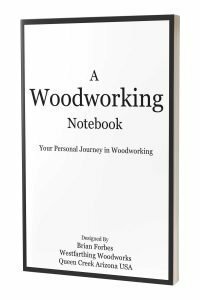 This notebook is your personal journey in woodworking, and in the end you will have a volume of knowledge that is uniquely yours, and a personal treasure. A place to write the important details on 20 of your woodworking projects, complete in every aspect. Each project is given six pages, covering materials, finishes, cut lists, project notes and more. A special area to attach a picture of your completed project at the end of each section. A large notes area with lined paper so you can capture your best ideas. 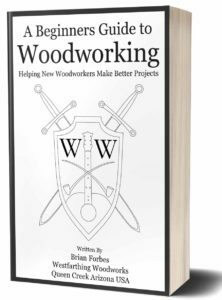 In the end, you will have an heirloom volume of your woodworking life that you can pass down to future woodworkers, or publish online. Capture Your Best Projects and Ideas Before You Lose Them! Unfortunately, when your project is still in the white, it’s hard to see the glue residue. A trick to bring out the hidden glue is to wipe the wood with water. The water reveals any glue that is hidden, and you can sand it out before it causes any problems under the finish. Don’t hose your project. A damp cloth will do the job. Wipe down the project, and mark the glue areas that you need to work on with painters tape. Once you are finished inspecting the piece, go back and remove the glue by sanding. Wipe the piece with water again, and if it passes the test, then you are finished removing glue, and you can go on to finishing. Your homework is to take some of this knowledge out into the shop and learn how to use wood glue better than you do now. If you made it all the way to the end of this post, and are over three thousand words deep with me, please don’t let this just be an academic exercise. When you go into your shop, maybe you are a glue hoarder and you have bottles from years and years ago rotting in a cold or hot garage. Dispose of those glue bottles and buy some fresh product that you keep in a climate controlled area. Watch your glue squeeze out, and make sure that you have good clue coverage inside your joints. This is the secret to a healthy joint, and one that you don’t have to worry about. After all, when you are done gluing something together, you should not have to worry about it failing later. 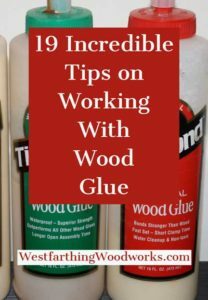 This has been 19 Incredible Tips on Working with Wood Glue, and I hope that you have learned something about this important substance. Wood glue is your main weapon in woodworking, and the more you know about it, the better. Take the time to apply what you learned here, and keep your mind open to learning even more as you work. As time goes by, you will just know the right amount of glue to use, and you will also be better at cleaning up the excess as you go. Wood glue is a very important part of your woodworking, so make sure to give it the time it deserves, and learn what you need to know. 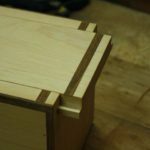 You should never have to worry about your glue joints, and if you do them well, you won’t have to.